"Improvisation is the ability to create musical ideas spontaneously. I introduce techniques to build a musical vocabulary of essential rhythmic patterns and melodic motives to stimulate creativity." Gregory Caputo specializes in “versatility within ‘traditional’ drumming styles” according to Modern Drummer Magazine. “Commanding drum set facility that speaks volumes with masterful rhythmic sensibilities” (Jazz Times Magazine); “Keeper of the Big Band Drummers Traditions.” (Classic Drummer Magazine.) A graduate of the Hartford Conservatory of Music Jazz and Pop program, Greg has toured with Artie Shaw, Count Basie, Harry James, Benny Goodman, Tommy Dorsey, Jimmy Dorsey, Woody Herman, Les Brown, and Nelson Riddle. Greg has played drums for noted artists such as Anita O’Day, Pearl Bailey, Sammy Davis Jr., Barry Harris, Rosemary Clooney, Nnenna Freelon and Annie Ross. Greg leads his own big band, Velocity. Their CD Classic Swing with Modern Drive featuring Phil Woods is receiving rave reviews. Greg is the author of Classic Swing Drumming. He is a D’Addario artist playing Promark drumsticks and Evans drumheads. 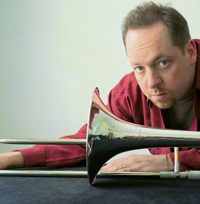 Trombonist Steve Davis was born in Worcester, MA and raised in Binghamton, NY where he was surrounded by parents, grandparents and friends who either played or deeply appreciated music. He played in bands throughout his school years in Binghamton and went on to attend The Hartt School (University of Hartford, CT) where he studied under the late Dr. Jackie McLean. After graduating in 1989, Davis moved to NYC where he soon joined Art Blakey’s Jazz Messengers. Steve’s first record date One For All (A&M) was Blakey’s last. A few years later, Davis returned to Hartford to join the faculty at Hartt and became a member of the Jackie McLean Sextet. After several years apprenticing with McLean (on the bandstand, touring the world and as a young teacher at Hartt), Steve toured extensively with Chick Corea & Origin. Davis has gone on to tour and record with a who’s who of jazz greats including Benny Golson, Freddie Hubbard, Cecil Payne, Hank Jones, Horace Silver, Cedar Walton, Harold Mabern, Larry Willis, Slide Hampton, James Moody, Jimmy Heath, Ron Carter, Christian McBride, Roy Hargrove and many others. Davis has maintained a longtime association with the acclaimed, collectively-led sextet One For All featuring Eric Alexander, Jim Rotondi, David Hazeltine, John Webber and Joe Farnsworth. Steve has 16 CD’s with OFA, 17 CD’s as a leader and appears on over 100 recordings as a sideman. As an educator, Davis continues to serve on the faculty at The Hartt School’s Jackie McLean Institute of Jazz where he has mentored up-and-coming musicians for over two decades. In addition to his usual teaching duties on campus, Davis has organized many off-campus, professional performances featuring current JMI students and/or alumni. Steve also had a busy year as a guest-artist/clinician working with jazz programs at University of Indianapolis, University of West Virginia, University of Minnesota Morris, MacEwan University in Edmonton, Canada, UMASS Amherst Jazz In July, Stanford Jazz Workshop, Jamey Aebersold’s Summer Jazz Workshop (University of Louisville) as well as working with Hartford-area public school students year-round. Recently, as a performer, Davis continues to be ever-in-demand. He performed with Stevie Wonder and The Roots on NBC’s Jimmy Fallon Show, as well as appeared at The White House with Christian McBride’s Big Band and Special Guests’ Tribute to Ray Charles on PBS. Steve just completed a two-week European tour with bassist Avishai Cohen’s NY Division sextet featuring Kurt Rosenwinkel. As a bandleader, Steve led his quintet/sextet in performances at The Greater Hartford Jazz Festival, Smoke and Small’s Jazz Clubs in NYC and at Black-Eyed Sally’s and The Charter Oak Cultural Center in Hartford. Steve has a new CD Say When celebrating J.J. Johnson, which has been #1 on Jazz Week radio; and For Real (Posi-tone) feat. Larry Willis with Abraham Burton, Nat Reeves and Billy Williams. In addition, Davis recently appeared on CDs by Steve Turre... Bones Of Art (High Note), Willie Jones III... Max Roach Tribute Live at Dizzy’s and forthcoming recordings by Charles Davis, Joe Magnarelli & Christian McBride. Davis toured Canada for one month as a featured guest with The Cory Weeds Quintet recording Cory Weeds’ Let’s Go feat. Steve Davis (Cellar Live) at Smoke Jazz Club in NYC. Steve continues to work with One For All (feat. Eric Alexander), The Larry Willis Quintet, The Dizzy Gillespie All-Stars (feat. Roy Hargrove, Cyrus Chestnut, Lewis Nash) and big bands led by Jimmy Heath, Ron Carter & Christian McBride. Davis was also nominated for the fifth consecutive year as Jazz Trombonist of the Year by the Jazz Journalists’ Association. "Helping students unlock their creative potential through various practice techniques, listening to all kinds of music, and playing everything in all keys are the ways I use to empower each musician as they become more independent in their own approach." Bruce Diehl is currently the Director of Jazz Performance at Amherst College. In this capacity, Bruce directs the Amherst College Jazz Ensemble, the jazz combos, and teaches jazz improvisation, jazz theory, and taught two history-based courses: the History of Jazz and the Birth of Bebop. Bruce also organizes the Jazz@Schwemm’s coffeehouse performance series hosted in the Campus Center each semester. In 1995, Bruce completed his Master’s Degree in Jazz Composition and Arranging at UMASS Amherst. While there he studied composition/arranging with Jeff Holmes, Yusef Lateef and Frederick Tillis and saxophone with Lynn Klock and Wayne Tice. Bruce completed his undergraduate studies at the Eastman School of Music, earning degrees in Saxophone Performance and Instrumental Music Education while studying saxophone with Ramon Ricker and Albert Regni, and jazz arranging and composition with Ray Wright. Bruce’s compositions and arrangements have been performed by various groups across the country, and he enjoys composing and/or arranging new works and transcribing recorded pieces for his student groups at Amherst College. Recent performances have taken Bruce to Sutton NH; Fryeburg, Maine; Atlanta, Georgia; Spokane and Ellensburg, Washington; Southern Vermont, and throughout Western Massachusetts. He has directed District Junior and Senior High Festivals in Vermont, Massachusetts and the Maine All-State High School Jazz Combo. His first recording as a leader Bug Juice was released in early 2015. “My approach to teaching jazz improvisation always leaves room to experience what each individual really sounds like.” Freelance guitarist and teacher, Ferrier has performed with Jon Faddis, Randy Brecker, Eddie Bert, John Fedchock, Claudio Roditi, Yusef Lateef, Peter Erskine and others. He holds a B.M. degree in Performance from Berklee College of Music, M.M. degree in Jazz Composition/Arranging from UMass Amherst, and has studied with John Laporta, William Leavitt, Herb Pomeroy, Bill Pierce, George Garzone, and others. He is a professor and Director of Jazz Studies at Holyoke Community College, and is the applied jazz guitar instructor at University of Massachusetts Amherst. States from the Kennedy Center in Washington, D.C. to Yoshi’s, the legendary West Coast jazz club and their most recent CD hit number one on the JazzWeek charts within weeks of its release. Jeffrey W. Holmes, Professor of Music and Director of Jazz and African-American Music Studies at the University of Massachusetts is a nationally published and commissioned composer/arranger, and a multiple recipient of National Endowment For The Arts Jazz Composition Grants. He has written music for John Abercrombie, Ernie Watts, Max Roach, Chris Vadala, Doc Severinsen, Paul Winter, Yusef Lateef, Rufus Reid, the Tommy Dorsey Orchestra, and the Big Apple Circus, as well as numerous works for college, high school and junior high jazz, concert, and marching ensembles. He has toured /performed around the world and was a featured artist on the Jazz at the Kennedy Center series in Washington D.C with the Bill Taylor Trio. 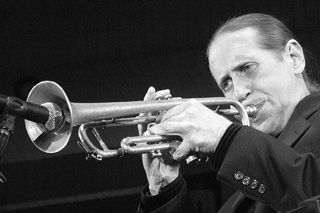 Other activities include ongoing appearances with the Paul Winter Consort, collegiate residencies, leading the Jeff Holmes Big Band (which has headlined at the International Trumpet Guild Conference), and playing lead trumpet with the New England Jazz Ensemble, Rob Zappulla Big Band and Earl MacDonald’s Yankee Gumbo Ensemble, as well as drums with the Amherst Jazz Orchestra. Mr. Holmes received the Lifetime Achievement Award from the Massachusetts Association of Jazz Educators, and is also the featured trumpet performer on the soundtrack to the PBS American Experience presentation A Class Apart as well as contributing composer to the source music for the PBS series Circus. At UMASS, Holmes directs the award-winning Jazz Ensemble I and Studio Orchestra. Students in the program have won over 40 Downbeat Magazine awards in virtually every annual collegiate Jazz category, and continue to appear at major national conferences. Recent recordings include CDs with the New York Latin All-Stars, (horn arrangements and trumpet), the New England Jazz Ensemble (lead trumpet/arranger), the Paul Winter Consort, (piano/composer), and his own critically acclaimed quartet project Of One’s Own on Miles High Records. He continues to guest conduct District/All-State jazz ensembles throughout the country, in addition to being in demand as a guest artist, adjudicator, clinician, commissioned composer and lecturer. He is also the Artistic Director of Jazz In July Summer Workshops at UMASS, and has served as a member of the Massachusetts Music Educators Association board of directors, columnist for JAZZPLAYER Magazine, and panelist for the National Endowment for the Arts, while contributing thirty jazz biographical entries to the New Groves Dictionary of American Music (Oxford Press). "Jazz improvisation is like any language; you study the vocabulary and grammar and you learn to construct sentences. The leap of faith begins when you start to musically converse with other musicians and hope that all your study allows you to hold appealing, affecting and eloquent dialogues." Catherine Jensen-Hole is a Senior Lecturer in the African-American Music and Jazz Studies Program at UMass Amherst. Catherine directs the DOWNBEAT award-winning Vocal Jazz Ensemble and teaches undergraduate instrumental arranging and composition, vocal jazz techniques, and the vocal jazz studio. Jensen-Hole has performed as a vocal jazz artist in Australia, Great Britain, Indonesia and the U.S. including performances at the Perth Concert Hall, the International Festival of Perth, Australia, and the National Theatre, London, England. She has received two awards for her performance from DOWNBEAT magazine and was a member of the award winning UNT Jazz Singers for 8 years. A sought-after clinician and adjudicator in vocal jazz, she has conducted All-State Choirs including the 2001 MENC All Northwest Jazz Choir and has been a faculty member at the North Texas Summer Vocal Jazz Workshop. In addition to co-teaching the vocal program here at Jazz in July with Sheila Jordan, Jensen-Hole has been a regular performer in the IAJE Music Educator Vocal Jazz Group, performing new vocal jazz music at the yearly conference. A resident of the USA, and citizen of Australia and the United Kingdom, Jensen-Hole received her Bachelor of Music in Jazz Studies from the Western Australian Conservatorium of Music (WAPPA), and both her Master of Music in Jazz Composition and Arranging, and Doctor of Philosophy in Music Education specializing in Jazz Studies, from the University of North Texas. Her recent CD release entitled Songs of Love, Life and Loss showcases her jazz compositions and arrangements of jazz standards. Faculty members Jeff Holmes, Felipe Salles, Tom Giampetro and Bob Ferrier join her on the album along with bassist Wayne Roberts and Australian accordionist Cathie Travers. Steve Johns is one of the most dynamic and versatile drummers on both the New York City and international Jazz scenes. Since the early 1980’s he has performed and recorded with virtually the who’s-who of the Jazz World. Steve has played with The Sonny Fortune Quartet, The Benny Carter Quartet, The Billy Taylor Trio, Nat Adderley, Jimmy Owens, Stanley Turrentine, Jimmy Heath, The Randy Brecker Quintet, Jesseye Norman, Dave Liebman, The Ronnie Cuber Band and many others. Steve Johns was born into a musical family in Boston in 1960, and began playing drums at the age of nine. His mother, Goldie Tyler Johns, was a songwriter, and three of her brothers were saxophonists, including the legendary Jimmy Tyler, who was Steve’s primary influence and inspiration. It was Jimmy who encouraged Steve to study formally with Alan Dawson, and his three years with the master percussionist and educator enabled him to make rapid progress. While attending Natick High School, Steve played in both the concert and jazz bands and earned chairs in both the district and state jazz ensembles. After graduating in 1979, Steve continued his studies at the New England Conservatory of Music where he received a thorough grounding in classical percussion from Vic Firth and Fred Buda, while playing with such local jazz greats as James Williams, Miroslav Vituous, Jeff Berlin, and Mike Stern. At NEC he met his wife-to-be, Debbie Keefe Johns, a fine saxophonist in her own right. In 1982, Steve made the move to New York, quickly establishing himself as an inspirational player at home in any musical style. Over the ensuing three decades, Steve has worked in every conceivable setting, from big bands such as the Gil Evans and the Count Basie orchestras, to accompanying singers like Jessye Norman, Helen Merrill, Diane Schuur, and Dakota Staton, to more experimental settings such as the Thomas Chapin Trio and groups led by Marty Ehrlich and Mario Pavone. He has toured worldwide as the regular drummer for Sonny Fortune, Benny Carter, Dr. Billy Taylor, and many other luminaries. His five-year tenure as a member of Taylor’s trio brought him wide exposure, including 75 performances for the pianist’s NPR program Jazz at the Kennedy Center with such guests as Wynton Marsalis, Nancy Wilson, Milt Jackson, and Randy Brecker. Steve has appeared on over seventy albums by Leon Thomas, George Russell, Thomas Chapin, Dr. Billy Taylor, Houston Person, John McNeil, Sonny Fortune, Peter Leitch, Gary Smulyan, and Bob DeVos, among many others. In addition to his work as a sideman, Steve is also a member of the collective group Native Soul, and has been co-leader on recording projects by that group (One Mind, 2012, American Showplace, Soul Step, Talking Drum Records), as well as on an album with saxophonist Peter Brainin (No Saints, No Sinners, Playscape). In addition to his extensive credits as a player, Steve has long been active as an educator. While with the Billy Taylor Trio, he took part in over a hundred lecture/demonstrations throughout the U.S., and has regularly served on the faculty for educational programs at the University of Massachusetts at Amherst, Long Island University, Montclair State University, the Litchfield Jazz Camp, the Vermont Jazz Center, and Jazz House Kids. Steve and Debbie co-direct the JCC Thurnauer TeenTown Jazz Program in Tenafly, NJ, which has featured such guests as Larry Coryell, Bernie Williams, and Jimmy Owens. "Improvisation is putting total feeling into a song, learning the songs exactly as written (melody, chord changes) and then making it your own. Listen, listen and listen some more! Never force improvisation; let it happen naturally." Born Sheila Jeanette Dawson in Detroit, Michigan on November 18, 1928, Sheila was raised in a poverty stricken town in Pennsylvania’s coal-mining country. She began singing as a child and by the time she was 14, Sheila was sitting-in on gigs in Detroit clubs. It was during this time, that Sheila connected with Charlie Parker who would become her musical guru. After moving to New York in the early 50’s, she married Charlie Parker’s pianist, Duke Jordan, and studied with Lennie Tristano, though it was not until the early 60’s that she made her first recordings. George Russel met Sheila while she was working at the Page Three Club in Greenwich Village, and he was responsible for her breakthrough album Portrait of Sheila in 1962 on Blue Note Records. In the mid-60’s her work encompassed jazz liturgies sung in churches and extensive club work, but her appeal was narrow even within the confines of jazz. By the late 70’s jazz audiences had begun to understand her uncompromising style a little more and her popularity increased-as did her appearances on record, which included albums with pianist Steve Kuhn, whose quartet she joined, and an album, Home, comprising a selection of Robert Creeley’s poems set to music and arranged by Steve Swallow. Sheila is the pioneer of the bass and voice concept. She has recorded with many fine jazz musicians aside from her own recordings on High Note and Justintime records. Sheila still teaches and appears in concerts and clinics all over the world. In May 2017, Sheila received an honorary doctorate in Fine Arts from The University of Mass, and The Jazz Legends Distinguished Achievement Award from The UMass Fine Arts Center’s Valley Jazz Network. Other awards include the New York City Nightlife Achievement Award for Outstanding Female Vocalist, the Mary Lou Williams Women in Jazz for Lifetime Service that was given in 2008, an IAJE Humanitarian Award, MAC Lifetime Achievement Award, Lil Hardin Armstrong Jazz Heritage Award, Baker’s Keyboard Lounge Lifetime Achievement Award 2004, the Barry Harris Award For True Jazz Mastery 2003, State of Michigan Society for the Culturally Concerned Award 1995, The Universal Jazz Coalition Award for Outstanding Jazz Contributions 1982, a nine-time recipient of the Downbeat Magazine Critics Award, talent deserving of wider recognition 1962-1975 and two National Endowment for the Arts grants. In 2001, she was one the Top Five Best Female Vocalists in Downbeat Magazine’s Critic’s Poll. Lost and Found was the United Kingdom-based Wire Magazine’s Best CD of the Year; and Confirmation won Vocal Album of the Year for Swing Journal in Japan. In 2010 she received the NY Nightlife Outstanding Vocalist Award and the Eleanor Isaacson Lifetime Achievement in the Arts Award. In 2011 Sheila received an NEA Jazz Masters Award, the nation’s highest honor in jazz music. And then in 2012 she received the Jazz Education Network Award for Outstanding Performance and the BMI Award. In 2015 she received the Austrian KUG Award from University of Gaz Austria. Andre Segovia received the same award. In January 2016, she received an honorary award from the Musica Hoehschule University in Gray, Austria. Her biography Jazz Child: A Portrait of Sheila Jordan was released in September 2014. Earl MacDonald is a composer, arranger, pianist and educator specializing in jazz. Originally from Canada, the former musical director for Maynard Ferguson is now a Professor of Music and the Director of Jazz Studies at the University of Connecticut. MacDonald earned a bachelor of music degree in jazz performance at McGill University and a master of music degree at Rutgers, where he apprenticed with Kenny Barron. He is an active clinician, guest conductor and teacher at summer camps. MacDonald’s last two CDs received JUNO nominations for jazz album of the year. For his chamber jazz explorations on Mirror of the Mind, MacDonald was described as “a magical, musical alchemist of hip hybrids” (Owen McNally, Hartford Courant). Similarly, his large ensemble project, Re:Visions was described as having “gone beyond where most big bands go, establishing Earl MacDonald as a major force in the world of jazz composition” (Dan Bilawsky, AllAboutJazz.com). From this album, Earl’s composition Bad Dream was selected as the winner in the jazz song category of the Tenth Annual Independent Music Awards. Visit MacDonald’s web site, www.earlmacdonald.com, where you can read reviews, hear and purchase music, take a free online lesson, peruse his blog, and learn more about MacDonald’s performances, teaching, and latest projects. Stephen has worked throughout the eastern seaboard with a variety of musical combinations from solo work to big bands. He is currently working on an album of original music. This is his second work to date. Barry Ries has been performing in the music industry for over 50 years, playing both trumpet and drums. Starting in the mid 1960’s, he played in a variety of dance bands, wedding bands and rock bands. Due to his musician father, David Ries, he also played with Dixieland bands, including playing with trombonist Bill Rank, the last living member of Bix Beiderbecke’s Wolverines. In 1970 he entered the North Texas University jazz program. From 1971 to 1973 he performed and recorded with the North Texas University’s One O’Clock Lab Band. He returned to Cincinnati, Ohio to continue his professional career, where, among other things, he played week-long engagements with alto player Sonny Stitt and vibraphonist Milt Jackson. Within a year’s time of moving to New York, he played, traveled and recorded with Gerry Mulligan, Horace Silver and Lionel Hampton. Over the next 16 years, he divided his time between NYC and Miami, performing with Mel Lewis, Dizzy Gillespie, Stan Getz, Clark Terry, Freddie Hubbard, Kenny Burrell, Hubert Laws, Jackie Byard’s Apollo Stompers, Woody Herman Orchestra, Artie Shaw Orchestra, Machito’s Latin Jazz Orchestra, Jimmy Heath, Lew Tabakin and Toshiko Akioshi Big Band and the Mingus Epitaph Orchestra. More recently Barry has played and recorded with the Steve Swallow Quintet, Joe Lovano Quartet and Joe Lovano Nonet as well as John Fedchock’s New York Big Band. He can be heard on his own CD Solitude in the Crowd on Double-Time Records. Genevieve Rose is an acoustic and electric bassist who has performed nationally for over 20 years with various jazz, big band, vocal, dixieland, and latin ensembles. She also currently directs the jazz ensemble at Smith College in Northampton, MA, teaches instrumental music at Orchard Hill School in South Windsor, CT, and has been a faculty member of University of Massachusetts Amherst’s Jazz in July Summer Music Programs since 1997. Genevieve has a masters degree in elementary education from Western New England College, a masters degree in special education from American International College, and an undergraduate degree in music from the University of Massachusetts, Amherst. She currently resides in Wilbraham, MA. A native of São Paulo, Brazil, Dr. Felipe Salles is an Associate Professor of Jazz and African-American Music Studies at the University of Massachusetts Amherst. Being an active musician in the US since 1995, he has had the opportunity to work and record with prominent jazz artists like Randy Brecker, David Liebman, Lionel Loueke, George Russell, Gunther Schuller, Sam Rivers, Herb Pomeroy, Jerry Bergonzi, Jovino Santos Neto, Oscar Stagnaro, Duduka Da Fonseca, Maucha Adnet, Tony Lujan, Luciana Souza, and Bob Moses. Felipe Salles’ fifth release, Departure on the Capri/Tapestry Label, has received raving reviews. In its four-star review, Downbeat Magazine calls Felipe’s music “crafting pieces that juggle intriguing complexity with buoyant rhythms and lush colors” and describes “his success in translating that approach to a more nimble small band without losing any of the richness or diversity.” A feature review on JazzTimes Magazine says “Felipe Salles blends the visceral and the cerebral on his fascinating fifth album, infusing classical modernist strains with the buoyant rhythms of his Brazilian homeland.” His sixth album, Ugandan Suite (Tapestry), has been described by jazz guitarist extraordinaire Lionel Loueke as follows: “This is one of the best progressive works I have heard in a long time. What a great blend of classical, African and Jazz music! The compositions and the arrangements are so well done, and in the most natural way. This music needs to be heard by the largest audience possible.” Dr. Salles is a D’Addario Woodwinds Select Reeds Artist/Clinician and an Andreas Eastman Saxophones Artist/Clinician. He currently works as a member of the New World Jazz Composers Octet, Kyle Saulnier’s Awakening Orchestra, Alex Alvear’s Mango Blue and Gonzalo Grau’s (Grammy Nominated) La Clave Secreta. This year (2018) Salles was awarded a John Simon Guggenheim Memorial Foundation Fellowship. He plans to use the award to create a new multi-movement work for jazz orchestra titled “Dreamers: The New Immigrant Experience,” inspired by the plight of those brought to this country as children and have sought protection under the Deferred Action for Childhood Arrivals (DACA). Avery Sharpe was born in Valdosta, Georgia, and his first instrument at age 8, was the piano. His first music teacher was his mother (Evelyn), a piano player and choir director in the “Church of God in Christ” He moved on to accordion and then switched to electric bass in high school. Sharpe enrolled at the University of Massachusetts, where he studied economics and continued to play electric bass in gospel, funk, and rock groups. While at UMass, he met the jazz bassist Reggie Workman, who encouraged him to learn the acoustic bass. Sharpe adapted quickly to the big instrument, and within a few years he was performing with such notables as Archie Shepp and Art Blakey. In 1980, Sharpe auditioned with McCoy Tyner and won a spot in the pianist’s group. He worked with Tyner almost continuously for more than 20 years, playing hundreds of live gigs and appearing on more than 20 records. Sharpe’s credits also include sideman stints with many other jazz greats, from Dizzy Gillespie to Pat Metheny, as well as leading his own groups. To date he has more than 13 titles as a leader, 12 of the titles are on his self-owned record label, JKNM Records. His latest JKNM recording is Sharpe meets Tharpe, released in March 2016. A tribute to Sister Rosetta Tharpe, it features the New England Gospel Choir, Charles Neville and R&B singer Meli’sa Morgan. Avery teaches at Williams College in the Music Department, where he is director of a small Jazz Ensemble, Artist Associate on Jazz Bass and Faculty Advisor for the Williams Gospel Choir. 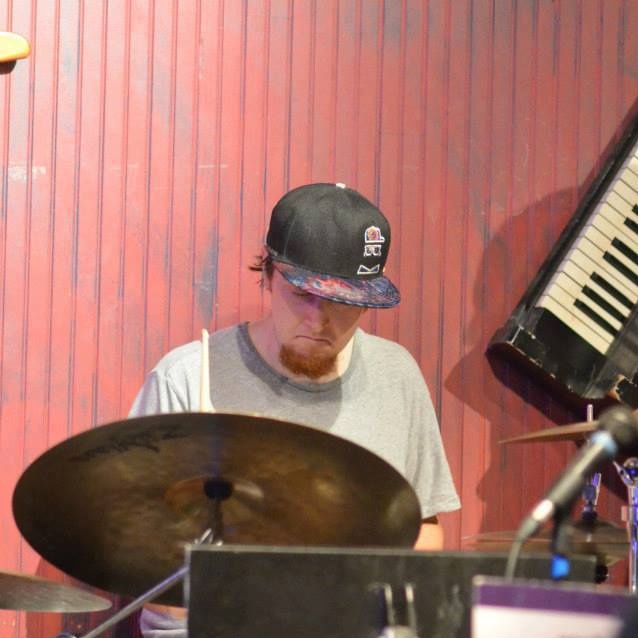 Ted Sullivan is an active drummer in the Pioneer Valley and Boston music scenes. He attended UMass Amherst from 2006-2011 during which he studied Jazz drum set under Bob Gullotti and Tom Giampietro. He is a current member of the Brian Thomas/Alex Lee Clark Big Band, Boston funk & soul outfit The Chicken Slacks, and his own instrumental hip hop project Full Spectrum Dominance. He also works regularly as a freelance musician throughout New England. An active jazz bassist Shigefumi has worked with Joe Lovano, Joey Baron, Tony Malaby, Ben Monder, Vincent Herring, Anthony Wonsey, EJ Strickland, Jeremy Pelt, Ron Affif, Dariusz Terefenko, Mark Kellogg, Tony Caramia, Mike Molito, Gian Carlo Cervone, the Roc City Stompers and the New Energy Jazz Orchestra. He has performed at such renowned venues as Carnegie Hall, Town Hall, Gracie Mansion, The Up Over Jazz Café, The 55 Bar, Cleopatra’s Needle, the Garage as well as Cecil’s and Trumpets in New Jersey. He also performed on the main stage at the 2013 and 2015 Xerox Rochester International Jazz Festival. He has released two recordings, Impromptu featuring a piano trio performing jazz standards and Untold which features his original compositions. Fumi completed his Doctorate of Musical Arts in Jazz and Contemporary Media Studies from the Eastman School of Music in 2015 and also holds degrees in Jazz Studies from the Manhattan School of Music (M.Mus.) and McGill University (B.Mus.). He has presented his work at the Jazz Education Network and the National Association for Music Education (2016). He is currently the Assistant Professor of Jazz Pedagogy and Performance at the University of Massachusetts Amherst. "I try to encourage students of improvisation or written composition to find their individual voice in expressing music." Frederick Tillis was born in Galveston, Texas on January 5, 1930. He is a graduate of Wiley College and received his M.A. and Ph.D. in Music Composition from the University of Iowa. His catalog includes more than 125 compositions and commissions, spanning both jazz and classical European traditions in various media - orchestral, jazz, instrumental, choral, chamber music, and vocal works. Melodic and harmonic textures reflect elements of various musics of the world, including Asian and Western cultures, as well as natural outgrowths of his ethnic and cultural background. Tillis' music is performed nationally and abroad. Among his commissioned compositions are "A Symphony of Songs," a choral/orchestral work based on poems by Wallace Stevens and commissioned by The Hartford Chorale, Inc. (1999); "A Festival Journey," (1992) and "Ring Shout Concerto," (1974) for percussion, written for Max Roach and premiered by Max Roach and symphony orchestra; and "Concerto for Piano" (Jazz Trio) and symphony orchestra (1983) written for Billy Taylor and performed with the Springfield Symphony Orchestra. Dr. Tillis has been the recipient of numerous honors and awards, including the 1997 Commonwealth Award from the Massachusetts Cultural Council, and an award for outstanding service from the International Association of Jazz Educators. As Professor of Music at the University of Massachusetts, he taught music composition and a survey course in the history of Afro-American Music & Musicians. Active as a jazz saxophonist, he has traveled with the Tillis-Holmes Jazz Duo and the Tradewinds Jazz Ensemble to Australia, Austria, Belgium, China, England, Fiji, France, Germany, Greece, Italy, Japan, Luxembourg, Mexico, Netherlands, New Zealand, Poland, the former Soviet Union, Switzerland, and Turkey. In addition, he recently visited the University of Fort Hare in South Africa, served as a Master Artist in residence at the Akiyoshidai International Art Village in Yamaguchi, Japan and conducted a three-week residency on behalf of the United States Information Agency at Chulalongkorn University in Bangkok, Thailand in 1991 to help the school establish a major in jazz. Dr. Tillis has published seven books of poetry: In the Spirit and the Flesh, Images of Mind and Heart, In Celebration, Of Moons, Moods, Myths, and the Muse, Harlem Echoes, Children's Corner: From A to Z, and Seasons, Symbols, and Stones. Two other books of poetry, Akiyoshidai Diary, and Scattered Ghosts and Southern Winds, are currently in preparation for publication. Dr. Tillis is currently Professor Emeritus in the Department of Music and Dance and serves as Director Emeritus of the University Fine Arts Center and Artistic Director of the Jazz in July Workshops in Improvisation at the University of Massachusetts at Amherst. Donate a one or two week scholarship! Click here. Select FAC from drop down menu. Select Jazz in July Scholarships from subcategory field.